Walter in a Raisin in the Sun research papers look at the main character in Lorraine Hansberry's novel about a black family in 1950's America. The main character of Walter in A Raisin in the Sun presents an excellent topic to write an American Literature research paper on. Walter can be approached as a character analysis or simplying look at the theme of the play from Walter's point of view. Although the play is filled with subplots, one of the most striking revolves around Walter Younger and his desire to better himself at the cost of his family if necessary. To ensure that his dream of escaping poverty comes true, Walter is willing to act in selfish and immature ways that ignores the feelings of those he lives with and loves. Walter serves several purposes in the play. He is Mama’s only son, Beneatha’s brother, Travis’s father, and Ruth’s husband. His interaction with each of these characters differs according to his own agenda. In many ways he is the central character of the play in that the plot revolves around him and his actions. For most of the play he appears as a selfish, self-absorbed individual with only his interests at heart. Walter’s role is that of the man of the family. Supporting the family is difficult however, and he is constantly on the lookout for a better way to make ends meet and to secure his own economic prosperity. To overcome the barriers that obstruct his goals, he devises schemes that end up hurting his family. For instance he gives Travis a dollar to spite Ruth, even though he knows that they cannot afford it. While his action benefits his son it is immature in that he did it simply to prove to his wife that he could. George in A Raisin in the Sun - Order your custom research paper on George in A Raisin in the Sun from Paper Masters. 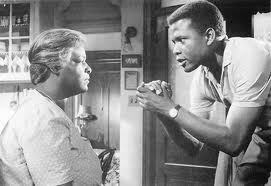 Conflict in Raisin in the Sun - Conflict in Raisin in the Sun can be seen in several characters of the play. A Raisin in the Sun relates the story of a working-class African-American family. Paper Masters writes custom research papers on Walter in a Raisin in the Sun and look at the main character in Lorraine Hansberry's novel about a black family in 1950's America.